Just Announced: A Very Merry Randy & Brady Christmas! A Very Merry Randy and Brady Christmas has just been announced. It kicks off December 11th with six stops through Texas! Pick a show and come out for a festive good time. 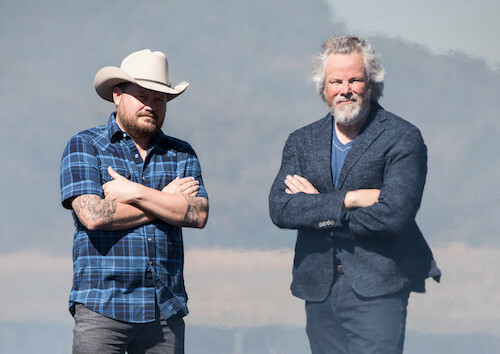 Robert Earl Keen and Randy Rogers want to come clean about their fictional identities: They're The Stryker Brothers. After secretly collaborating on a 13-track album, Burn Band, which they released under the fake band name on Sept. 7, the Texan country stars tell Billboard they're ready to take credit for the LP, a mix of honky-tonk and the hard-driving sound of Texas' red dirt country. They plan to perform one and only Stryker Brothers show on Dec. 22 at The Moody Theater in Austin. Keen, the celebrated 62-year-old singer-songwriter, and Rogers, the 40-year-old leader of the Randy Rogers Band, were only acquaintances before last year, when they bonded shooting promotional videos for John T. Floore's Country Store, a roadside music venue in Helotes, Texas. Randy Rogers has partnered with Rock Libations, formed by independent Restaurant pioneers Josh Babb and Sean Clavir, for ChopShop Live -- the first restaurant, bar and worldwide club of its kind in Roanoke, TX. To celebrate the venue's grand opening, Rogers will present a concert on Saturday, July 14, at 5 PM CST featuring fellow Texan Wade Bowen. Read more here! When Pat Green released his major label debut album Three Days in 2001, it introduced the singer-songwriter to a national audience, with its follow-up, 2003's Wave on Wave, raising his profile even higher via the hit title track. But in his native Texas, Green was already a star, adored by a dedicated fan base built by playing the dancehall circuit and respected by fellow musicians. Now, some of the artists he influenced are saluting the Lone Star State hero on Dancehall Dreamin': A Tribute to Pat Green. Due April 5th – Green's 46th birthday – the record features renditions of his songs from artists like Jack Ingram, Josh Abbott Band and Aaron Watson. Randy Rogers Band performs the title track to Green's essential Three Days, enlisting Radney Foster – who co-wrote the song about the grueling life of a touring musician with Green ­­– for an assist. Read more on RollingStone.com here!